Pie Basket is very basic round pattern that requires a 20" from notch to notch handle. 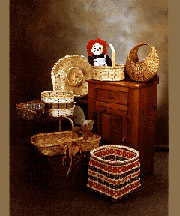 Gathering Basket is made with a 10" X 10" Square hoop for the handle and has a ceramic tie on. Chip and Dip Basket is round with a woven center basket. Hen Basket is an old pattern that was actually used to tote a hen from farm to farm. Woven on three round hoops. Wild Things Wall Pouch is woven with many natural items that you can add from your found collected treasures. Wild Things Visions also has many natural type weavers added for viewing pleasure. 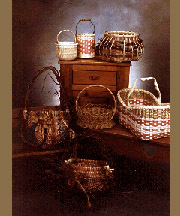 Little Bucket Basket has a twilled side weave with 5 ½" wire handle. Oval Japanese Weave Basket has dyed spokes and wooden center insert for accent. Requires a 9" swing notched handle. Nantucket Lightship Basket is woven on an 6" mold which we rent by the month for those interested. Made in the traditional Nantucket way. Treasure Bowl is also made on a mold and has many added treasures from your collected items. The border is sewn on with wax linen thread. Ona’s Basket was taken from an antique basket brought in by one of Sandy’s students. Woven on a 8" X 11" oval wood base, the pattern describes the unique upside down weave. Medium Market Carrier is a great carry all with a closed woven bottom and built up sides ends. Requires a 10" X 13" Victorian handle. Americana Storage Basket done in Red White and Blue weavers on a 12 ¼" X 12 ¼" wood base with ball feet. A diamond weave is the center accent along with a rim incorporated into a top braided border.